Discover our favourite hotels, restaurants, nightlife and things to do in Madrid right now. This insider's city guide has been a long time in the making. We've eaten in countless Madrid restaurants, dined in the best local eateries and visited the latest hotspots. We've also asked the most discerning locals we know to share their favourite hangouts – whether brand new or classic institutions. We bring you our hand-picked selection of our favourite places in Madrid right now. Whether you're looking for the ultimate luxury hotel, a cosy boutique hotel, or an ultra-cool design hotel, here is our pick of the best places to stay in Madrid. Housed within a 19th-century palace, Hotel Unico is a haven of grand staircases, gleaming marble and verdant private gardens. With an exclusive, sophisticated feel, Hotel Unico has the air of a dramatic private residence, where guests can sink into a plush sofa in the hotel’s cosy library, retreat to one of 44 classically-elegant rooms, or enjoy an indulgent Natura Bissé spa treatment. The hotel also boasts one of the city’s most prestigious gastronomic experiences by two Michelin-starred chef, Ramon Freixa. With the air of an exclusive members club, TÓTEM Madrid nestles in the elegant Salamanca neighbourhood, home to some of the city’s most fashionable boutiques and restaurants. 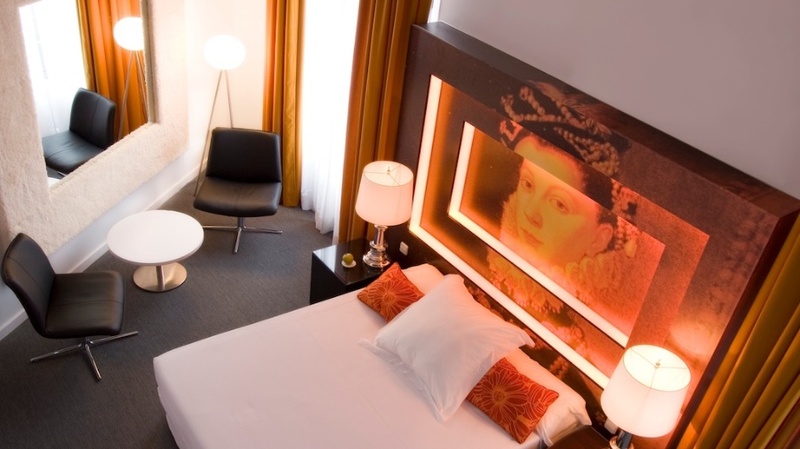 Oozing cosmopolitan style, TÓTEM features a minimalist aesthetic throughout its 20 sleek rooms. Sink into a plush velvet booth in the Art Deco-style cocktail bar, then unwind amidst the natural tones of Hermosos y Malditos Mediterranean restaurant. Eschewing the over-the-top, marble-clad opulence of other luxury hotels in Madrid, the Hotel Villa Magna offers a sophisticated blend of five-star indulgence, immaculate design and discreet service that attracts visiting dignitaries and celebrities. 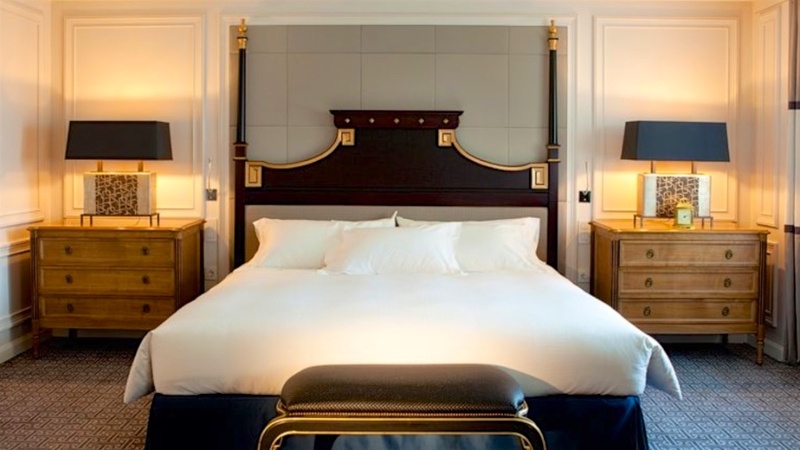 The 150 contemporary-classic rooms ooze understated luxury with plush velvet armchairs, rich mahogany woods, marble bathrooms and exclusive scents by French perfumer, Blaise Mautin. Sip champagne on the sultry Magnum Bar patio which is surrounded by the exotic greenery of the hotel’s lush garden, before deciding between the superb Cantonese cuisine of Tse Yang restaurant and the casually elegant terrazza of the Restaurante Villa Magna. Located just moments from the Puerta de Alcalá and the Prado, The Principal couples a superb central location with some of the best views in downtown Madrid from its stunning rooftop terrace. Capitalising on its elegant early 20th century architecture, The Principal’s lofty spaces flaunt towering columns in light-filled interiors, while rooms are irresistibly chic in charcoal and black. The Principal’s trendy rooftop retreat is the jewel in the crown, with the 6th floor Atico restaurant overseen by top chef Ramón Freixa. La Terraza is the glamorous rooftop oasis showcasing romantic panoramic views. Whether you're looking for a fabulous foodie dining spot, the city's best casual eatery, or a see-and-be-seen dining spot, here is our pick of the best places to eat in Madrid right now. The place to see-and-be-seen in Madrid, Amazonico represents another smash hit dining spot by chef Sandro Silva and Marta Seco, whose portfolio of local hotspots includes Restaurant El Paraguas and Ten con Ten. Start with a craft cocktail at the elegant bar then savour inventive fusion dishes, such as Argentine steaks, sushi, succulent tandoori grilled meats and Hawaiian specialities. Renowned chef Diego Guerrero says everything about his culinary philosophy in his restaurant’s name, Dstage – i.e. “Days to Smell Taste Amaze Grow and Enjoy”. Set within a funky industrial setting, Dstage invites you on a surprising and sensory 12-, 14- or 17-course tasting odyssey, which may include nostalgic dishes inspired by Guerrero’s mother’s cooking, or more theatrical modern creations. Every table enjoys a front row view of the action of Guerrero’s open kitchen, where you’ll feel as though you’ve joined an intimate local dinner party. A favourite dining destination of Madrid’s leading chefs – including celebrated local chef, David Munoz (DiverXo) – Sacha was launched by chef Sacha Hormaechea, whose parents named the restaurant in his honour in 1972. Famous for his mastery of meats, exceptional local ingredients and superb seafood, Sacha riffs on a seasonal theme in dishes such as spider-crab lasagne, hearty beef with marrow, and fried scallops drizzled in butter. While intimate low-lit interiors reveal antique furnishings, framed sketches and hanging jamons, the leafy terrace is home to a scattering of coveted tables during the warmer months. One of Madrid’s most beloved culinary addresses, La Tasquita de Enfrente is an institution of inventive, seasonal Spanish cuisine by chef Juanjo López. Loyal locals and avid foodies flock to hear the chef personally explain the daily menu, which is crafted from the finest market-fresh produce and pairs perfectly with La Tasquita’s great wine list. Surrender yourself to chef López’ expert selection, where the nightly tasting menu combines contemporary flair with traditional flavours. There’s only a handful of tables in this intimate dining space decorated with white-wooden panelling, bare brick and an elegant gallery of framed prints, thus reservations are recommended. The first Mexican restaurant in Europe to be awarded one Michelin Star, Punto MX is the brainchild of chef and owner Roberto Riaz, whose fusion of bold Mexican flavours and contemporary cooking techniques has made this one of the hottest tables in Madrid. The Punto MX experience begins in its chic upstairs bar, where expertly-crafted cocktails are served amidst plush armchairs and monochrome tiles – this is also Spain’s first ‘MezcalLab’ with the largest selection of Mezcal in Europe. At the restaurant, enjoy house-specialty guacamole made to order at your table, followed by dishes such as red tuna tacos, braised duck enchiladas and oxtail colado tamale, all crafted using ingredients grown in Punto MX’s in-house organic garden. In Madrid’s upscale Salamanca neighbourhood, award-winning chef Javi Estevez celebrates nose-to-tail dining at La Tasqeria, the chef’s passion project housed in a funky industrial space. Amidst concrete pillars, exposed brick walls and industrial lamps, Estevez’ famous signature suckling pig’s head emerges from the open kitchen along with succulent sweetbreads, pig’s trotters and hearty stews of chorizo, pig snouts and tripe. Enjoy an innovative culinary adventure for daring gourmands. Our favourite food market in Madrid is the Mercado de San Miguel, filled with fresh food stalls and tapas bars. The Mercado de San Antón is another popular local market, where you’ll find everything from fresh flowers to a wide variety of Spanish wine, cheese, meats, seafood, desserts, and more. Awarded two Michelin Stars for his original Restaurant Bibo in Marbella, chef Dani García has brought his Andalucian fusion cuisine to an elegant address in Madrid. Defining his cuisine as “borderless”, the chef has created an eclectic menu of specialities such as his signature cherry gazpacho with fresh cheese snow, pistachios and basil, and the sumptuous foie gras and goats cheese millefeuille. Spectacular interiors are the work of designer Lázaro Rosa-Violán, who has transformed this 800-metre space into a dream-like scene where a hot air balloon hangs above the circular bar and 7,000 light bulbs illuminate the dining room. Whether you're looking for the perfect cocktail, the city's best alfresco bar, or a late-night club, here is our pick of the best places to drink and party in Madrid right now. Discover one of Madrid's hottest nightlife destinations. Madrid’s hottest see-and-be-seen destination, Tatel blends a sleek cocktail lounge, intimate restaurant and live performance space inspired by the irresistible elegance of the 1920s. Live vocalists and visiting DJs take centre stage at Tatel, where guests can sink into red leather Chesterfields and enjoy superb cuisine by renowned chefs Nino Redruello and Patxi Zumarraga, or sip premium cocktails in the sultry-lit, stone-clad bar. With celebrity investors including Rafael Nadal and Enrique Iglesias, Tatel now boasts glamorous outposts in Miami and Ibiza. 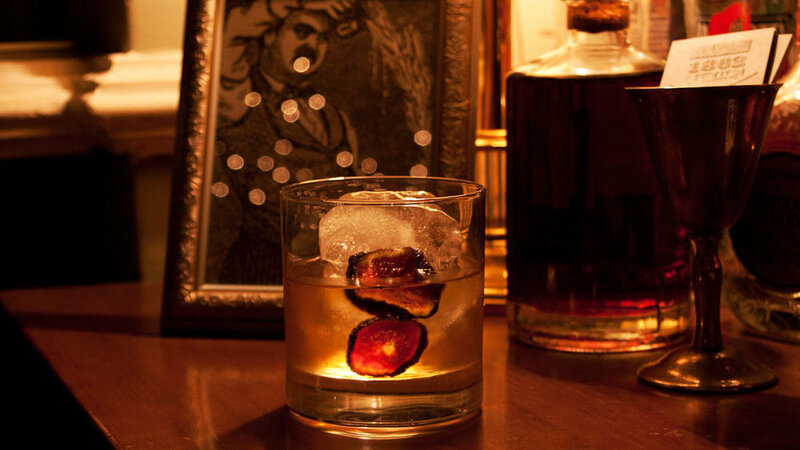 Discover a glamorous gastro-bar by Spain’s most famous mixologist. Setting the bar for cocktails in Madrid, Salmon Guru is a favourite with the city’s celebrities and cocktail connoisseurs. Argentine cocktail star Diego Cabrera is the talent behind this quirky drinking den, where deep green ceilings and jet black tiling set a sultry mood. 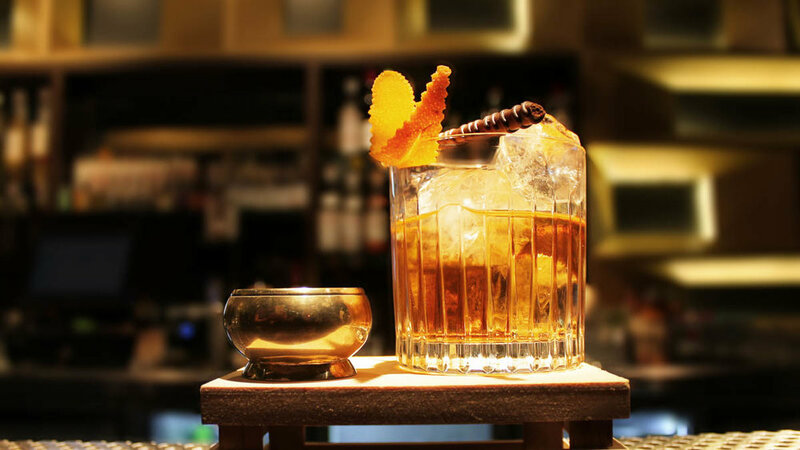 Order some gourmet bites, perch at the wooden bar and watch as Salmon Guru’s friendly staff craft a potent mix of cocktails, from the classic gin fizz and mojito to more avant garde creations - don’t miss the range of mezcal creations. Famous for its warm welcome and speakeasy feel, Salmon Guru is the go-to address for mixology in Madrid. A subtle speakeasy vibe holds sway in this stylish wine bar and restaurant. A haven for wine lovers, Angelita Madrid is the work of the celebrated Villalón brothers, whose renowned El Padre restaurant is still fondly remembered by local foodies. Using ingredients taken from the brothers’ own garden, a contemporary seasonal menu is served in the restaurant on the ground floor, while in the trendy basement an intimate world of Chesterfield sofas and bare brick pillars awaits those in search of meticulous mixology. Peruse an international wine list of more than 500 labels, choose from a range of artisanal beers or enjoy the playful presentation of Angelita’s expertly-crafted cocktails. A collection of sleek spaces for cocktails, eclectic cuisine and al fresco glamour. With its eclectic interiors designed by world-famous creator Philippe Starck, Ramses reveals an array of glamorous spaces, from the futuristic Champagne Bar in immaculate whites, to the sleek terrace with its stylish after-work cocktail crowd and views over the Puerta de Alcalá. Savour contemporary Japanese cuisine at Natsuki, where tables are decorated with moving digital images and neon graffiti pops against a white palette, or discover the elegant grandeur and Mediterranean cuisine of the more formal Suria restaurant. A stylish see-and-be-seen tapas bar and restaurant. Affectionately known as ‘Quintin’, this relaxed tapas bar is the work of local gastronomic trend-setters Sandro Silva and Marta Seco, whose hotspots include Ten con Ten and El Paraguas. Attracting a stylish clientele of celebrities and well-heeled locals, Quintin’s elegant spaces buzz with conversation as small plates of classic Spanish morsels weave through lofty interiors in red brick and wood, where delicate iron-work and an abundance of greenery lends a colonial feel. Candlelight flickers beneath vaulted ceilings by night, as visitors share plates of Iberico ham, traditional pan con tomate - fresh bread with garlic and crushed tomatoes - and artichoke lasagna. Sidle up to the bar to peruse the expertly-curated wine selection while soaking up the vibrant atmosphere. Classic cocktails meet bespoke creations at this relaxed cocktail bar. Celebrated cocktail craftsman Alberto Martínez helms the shakers at 1862 Dry Bar, an award-winning temple to mixology in the trendy Malasaña neighbourhood. Join the after-work crowd who come to sip classic Cosmpolitans in the elegant ground floor bar, or arrive late in typical Spanish style to join the revels in the intimate basement bar. While the meticulously-crafted cocktail menu is guaranteed to tempt, allow 1862’s talented team to create something special just for you. You won’t regret it. Discover this exclusive, after-hours scene. Art and hedonism collide at Madrid’s Arts Club, where sophisticated fun-seekers are lured into a heady world of expertly-crafted cocktails, DJ-spun sets and exclusive weekend parties. You’ll find Madrid’s beautiful crowd surrounding the sunken bar to watch dapper mixologists craft premium cocktails by Rocio Ferrer. With a Martini in hand, sink into a velvet Chesterfield and admire the work of British street artist Inkie, whose vast mural is on permanent display. A fun, creative-yet-casual tapas bar. Join Madrid’s late night party scene at one of the city’s nightclubs. Housed within a 19th-century theatre and famous for partying 365 nights a year, Joy Eslava is an icon of the Madrid nightlife scene where every night offers a new experience, from house, R&B and hip hop to live bands and cabaret shows. At Kapital, seven floors of revelry guarantees a social scene for every taste. Dance to the techno beats and mesmerising light shows of the first floor, or keep exploring to discover a karaoke lounge, R&B room, Greatest Hits area and 7th-floor outdoor terrace. With a more exclusive crowd, New Garamond offers the chance to celebrity spot on its vast dance floor or glamorous balconies, while at BlackHaus, the VIP vibe makes it a favourite with Spain’s elite. From the heated terrace and glamorous restaurant to the basement nightclub with its graffiti-clad walls, BlackHaus is the place for Madrid’s wildest party scene. A glamorous rooftop terrace with spectacular city views. Perched high above the city on the rooftop of the stylish ME Madrid Hotel, The Roof pairs panoramic views and low-lit glamour with decadent cocktails. Guests are whisked up from the ground floor in a private elevator to the sleek decked terrace, where views over Madrid’s famous Plaza Santa Ana are enjoyed from plush velvet beds and Madrid’s elite can be found at the exclusive VIP lounge. Dress to impress and dance the night away to cutting-edge beats with Spanish celebrities, football players and fashionable locals. Don't miss these incredible Madrid museums, cultural landmarks and local experiences. Boasting one of the world’s most impressive art collections, Museo del Prado is home to a collection of over 7,800 art works, including priceless 16th- and 17th-century treasures from masters such as Raphael, Botticelli, Rubens, Velazquez and Goya. Another must-visit museum in Madrid is the Museo Thyssen-Bornemisza, which showcases a superb collection including European masterpieces by Rembrandt, Renoir, Degas and Raphael. One of Madrid’s finest contemporary art museums is the Centro de Arte Reina Sofia, which enjoys a unique setting within a former hospital and displays a cutting-edge collection of 20th- and 21st-century works by Spanish artists – don’t miss Picasso’s world-famous Guernica, the jewel of this superb collection. One of the largest royal palaces in Europe, the Palacio Real is the official residence of the King of Spain which is home to a priceless collection of treasures. Founded in 1559 by Joan of Austria, the Convent of Las Descalzas Reales is both a working convent and an award-winning museum, with its own priceless collection of artworks, ceiling frescoes, tapestries and sculptures, including works by Rubens and Titian. The Parque del Retiro is one of the most famous parks in Madrid, where you’ll find a local crowd walking, jogging and socialising during the week. Formerly a royal garden, the park was opened to the public in the 1860s and is one of the city’s most prized verdant sanctuaries. The Real Jardin Botanico is a beautiful garden in Madrid’s city centre, lined with statues and located close to the Prado Museum. Don’t miss the picturesque views of the Casa de Campo which can be seen from the park on a clear day. The heart of central Madrid and the home of some of the city’s most impressive landmarks, the Centro district is a must-visit area for any visitor to Madrid. Key sights include the imposing Plaza Mayor, the vibrant El Rastro flea markets, and the city’s central meeting point, the Plaza Puerta del Sol. Another popular area is Salamanca, one of Madrid’s most fashionable areas with designer boutiques, upscale restaurants, and trendy nightlife spots. Chueca is Madrid’s trendy quarter, where funky stores mingle with hip bars and atmospheric casual restaurants. Recoletos is Madrid’s cultural district, where you’ll find iconic art museums such as the Museo del Prado, the Museum of Decorative Arts, and the verdant Parque del Retiro. Lavapies is the home of some of Madrid’s best art galleries, museums and live performance theatres, while CaixaForum Madrid is a seven-storey cultural complex of art, drama and live music. Madrid has been hosting major corridas (fights) in the historic Plaza de Toros stadium since 1931. While the debate continues as to whether bullfighting is an art form, a passionate sport, or simply an inhumane spectacle, watching a bullfight in Madrid is nonetheless a unique local activity. Alternatively, the Madrileños maintain a fiery, passionate love affair with football and its local Real Madrid players. Whether you're a football fan or not, it’s a highly memorable experience watching a live game at the state-of-the-art Santiago Bernabéu stadium. A flamenco performance in Madrid is topped only by a flamenco lesson with an experienced local instructor. Casa Patas is a historic flamenco performance space and flamenco school where many of the world’s best flamenco dancers and musicians have graced the stage. Having opened over 100 years ago, El Rastro is a popular Spanish flea market in Madrid’s Centro area which sells a wide range of second-hand treasures. One of the trendiest shopping areas in Madrid is in the Salamanca district, where streets such as Callejón de Jorge Juan are filled with designer boutiques and fashion stores. For an all-in-one department store experience, visit El Corte Inglés which is home to several floors of fashion, beauty, electronics and a gourmet delicatessen, which is the ideal place to pick up some Spanish wine, cured meats and other local products. Madrid’s main commercial shopping area is centred around Calle de Serrano in the Centro district, where you’ll find major international brands such as Zara, along with independent local boutiques. One of the best food markets in Madrid is the Mercado de San Miguel, filled with many fresh food stalls and tapas bars which are packed with locals enjoying a casual bite and a glass of Spanish wine. The Mercado de San Antón is another popular local market, where you’ll find everything from fresh flowers to Spanish wine, cheese, meats, seafood, desserts, and much more. The O2 Centro Wellness is a one-stop pampering spa with a wide range of beauty treatments, pilates, aqua aerobics, a sauna and more, with four locations in Madrid. The Lab Room is another popular local spa with state-of-the-art hydrotherapy pools, aromatherapy showers, massages, fitness equipment and beauty treatments. For Zen-inspired relaxation, Chi Spa offers the best of Eastern and Western face and body treatments in a soothing, peaceful environment. Soak in a hot or cold bath then enjoy a massage at Diacqua Spa in Madrid’s Retiro district, the perfect way to relieve tension and stress.